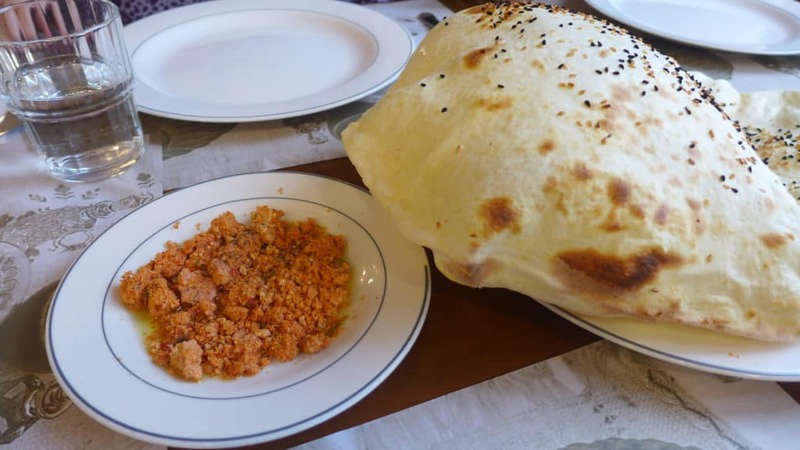 My trip to Istanbul last May held a number of firsts for me. First time in a Muslim country, first time setting foot on Asian soil, and first time doing a walking food tour, among others. Normally I’m not into tours AT ALL…I don’t like crowds, forced social interaction, having to stick to someone else’s schedule, or listening to someone yammer on. 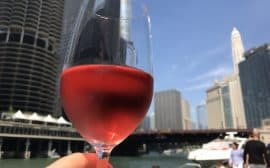 But these walking food tours are so different from my past experiences with tour groups. Our group was intimate—just me, my friend, and a newly married couple from Seattle—and our guide was very knowledgeable and kept the tour moving at a good pace. 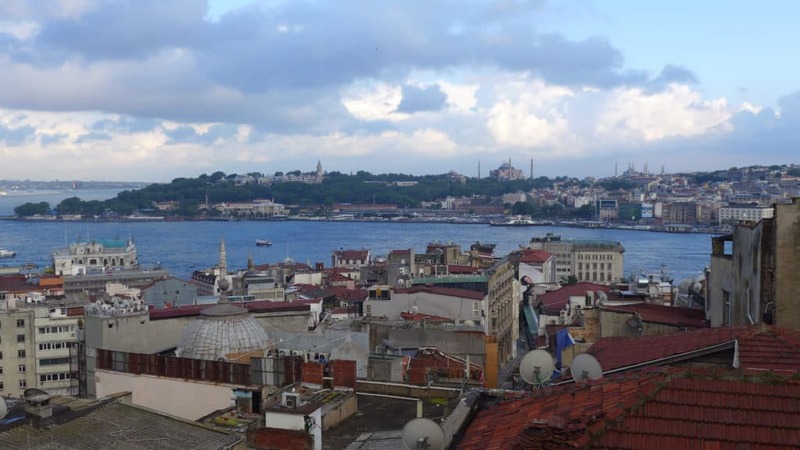 We woke up bright and early on our first morning in Istanbul to this gorgeous (though at the time, much rainier) view from our apartment’s patio, and were on our way. While we were waiting for our tour guide by the ferry docks, we stopped for a Turkish coffee. It’s…grainy. 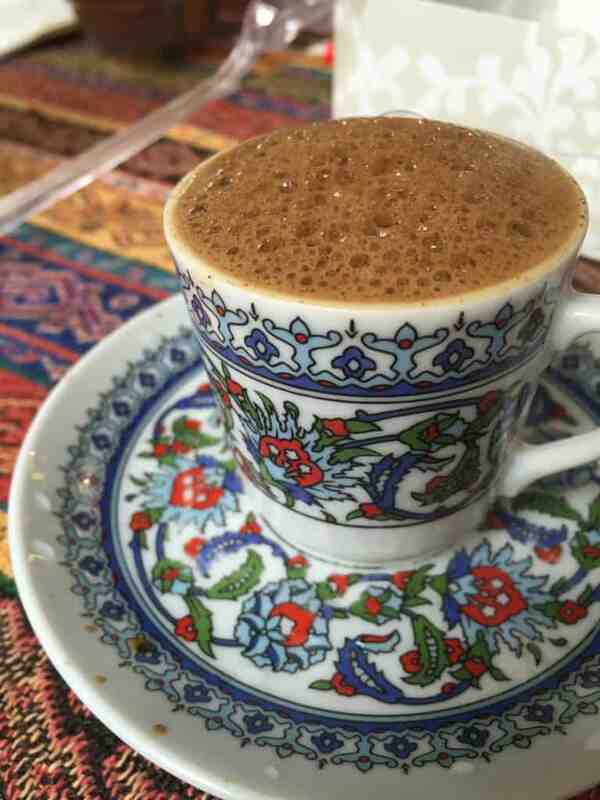 @FareWhispers had a salep instead, which is a warm creamy drink made with powdered root of a rare orchid, mixed with cinnamon. It’s really sweet but delicious, a bit like if hot chocolate were vanilla instead. But apparently the orchid is near extinction, which we didn’t know when we had it. We met our tour guide, Kerem, at the Karaköy ferry port on the European side. 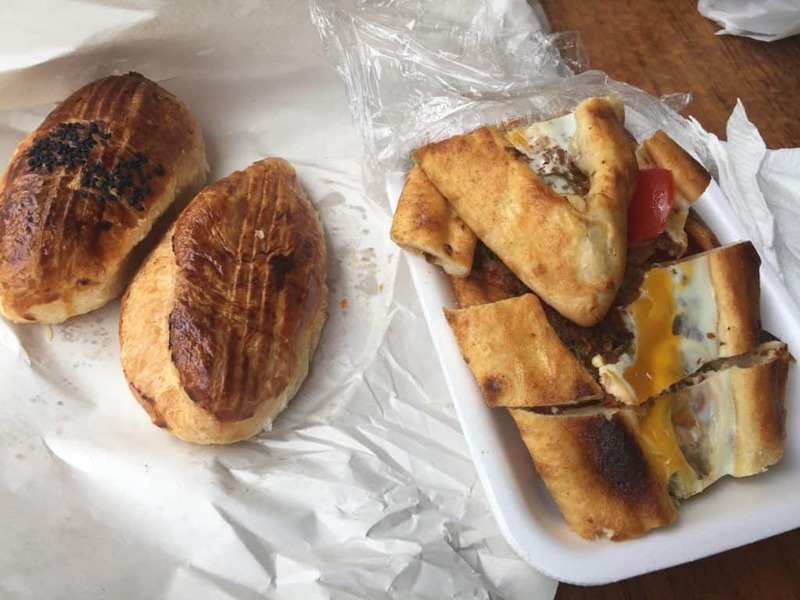 Before boarding the ferry, he bought a couple simit from a vendor and handed us each a piece to eat on the boat. 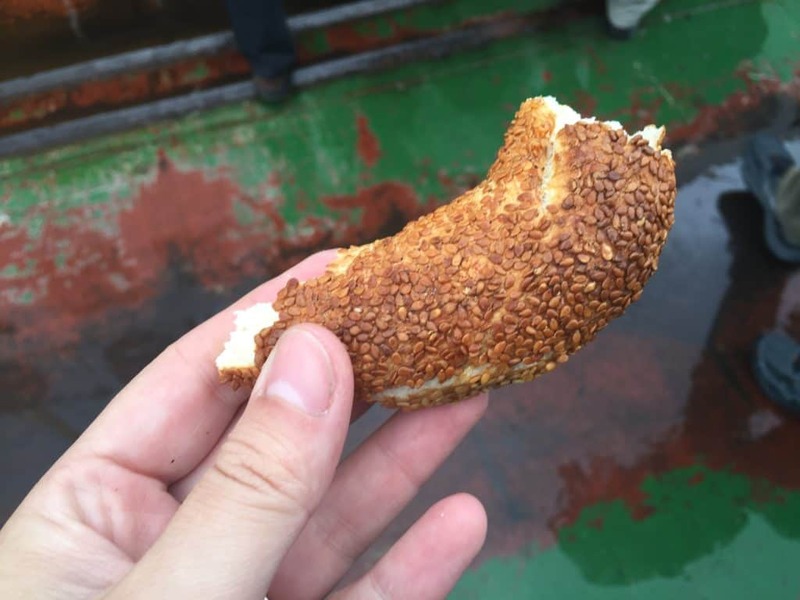 It’s a circular bread that looks kind of like a flat, sesame seed bagel, and only costs like 1 lira (about 33 cents). It’s a super cheap and easy snack for students and workers, and there are vendors literally every few feet selling them (or carrying around stacks on their heads). 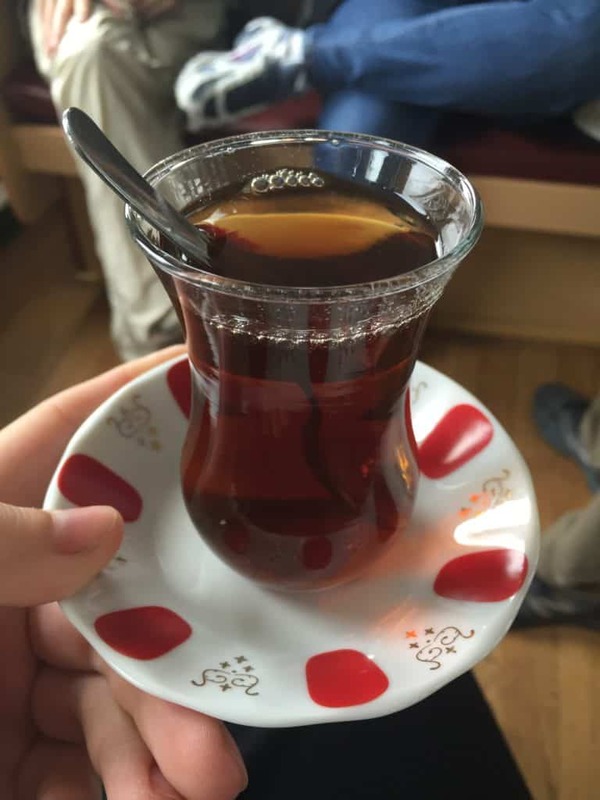 The traditional Turkish black tea (çay, pronounced “chay”) is a staple of every meal and almost every social interaction as well. On the ferry ride over to Kadiköy, Kerem explained some of the history of the Asian side of Istanbul and also gave us a sense of what the tour would entail, and brought us each a cup of tea. Istanbul is the only major city to sit on two different continents—some of its inhabitants literally cross continents to go to work every day! When we got off the ferry, we had to dodge raindrops to get to the main market, and dove into the warren of little stalls and shops. While the Asian side certainly sees its share of tourists, you can tell that this is a real residential market, filled with fish stalls, fresh fruits and veggies, spices, small grocery stores, and little cafes filled with older men. 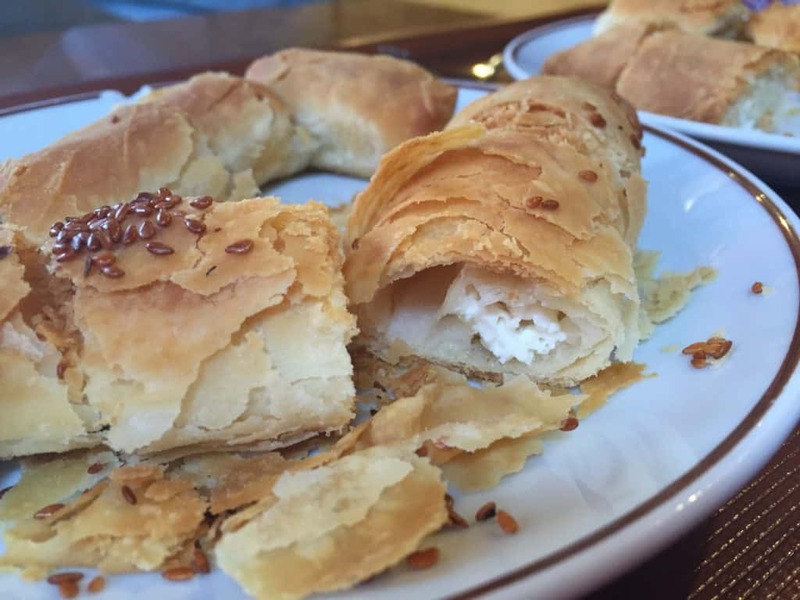 We stopped at one little pastry shop for some flaky burek, filled with soft cheese and topped with sesame seeds. The texture of the pastry was absolute perfection, so crispy and light. Our next stop was a candy and sweets shop, filled with (among other things) dozens of varieties of candied fruits and vegetables. 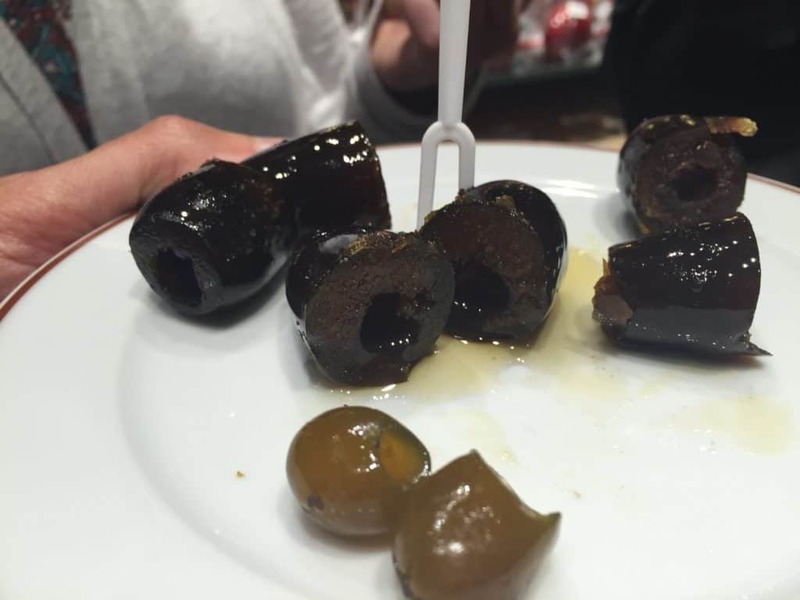 Kerem wasn’t going to let us have something as normal as cherries or pears, though—he brought us candied olives and eggplant to try. I’m not a huge fan of either, and anything candied is way too sweet for me, but they were quite tasty and a novel experience. After wandering from shop to shop, we sat down for a while to eat something more substantial. 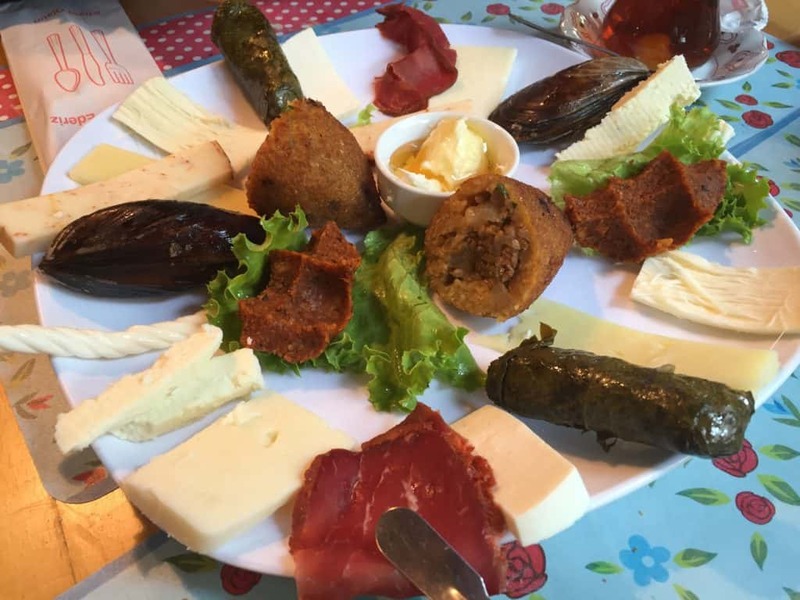 Though the rain wouldn’t let up, we devoured different types of Turkish cheese, meats, red pepper rice, stuffed grape leaves (dolma, the yummiest I’ve ever had), a potato or rice-covered meatball (kofte, I think), and honey and sweet cream with bread. That Snap pretty much sums up this experience. I’m willing to try most things, but I completely DETEST anything pickled. I tried, guys, I really did. Even the smell in the store made me want to gag. Because yes, that is a mug of pickled liquid. Ugh. And I escaped. Whew! We walked off calories and dodged the rain pouring off the awnings. 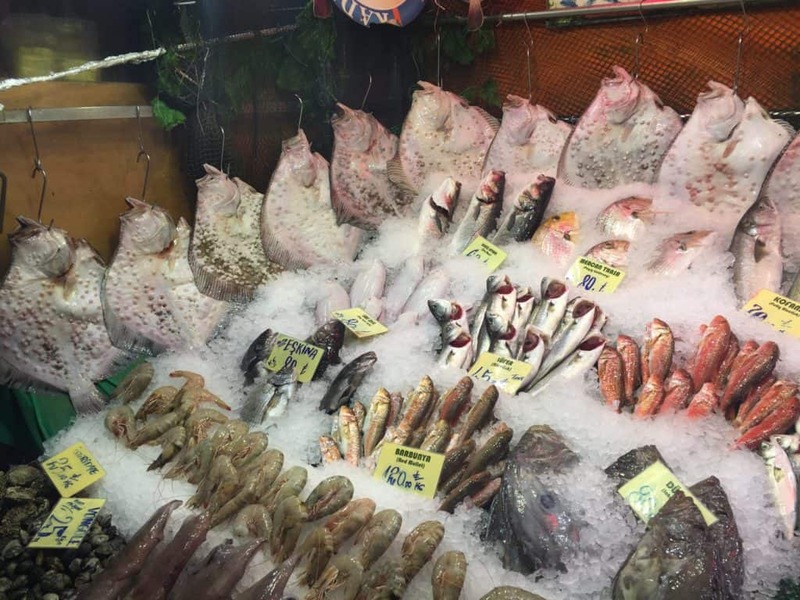 I was fascinated by all the different varieties of fish at each of the stalls. The colors and the different colors of silver scales were so cool. My favorite stop! Kerem led us to Honeyci, a little store that’s all about honey. AS AM I. 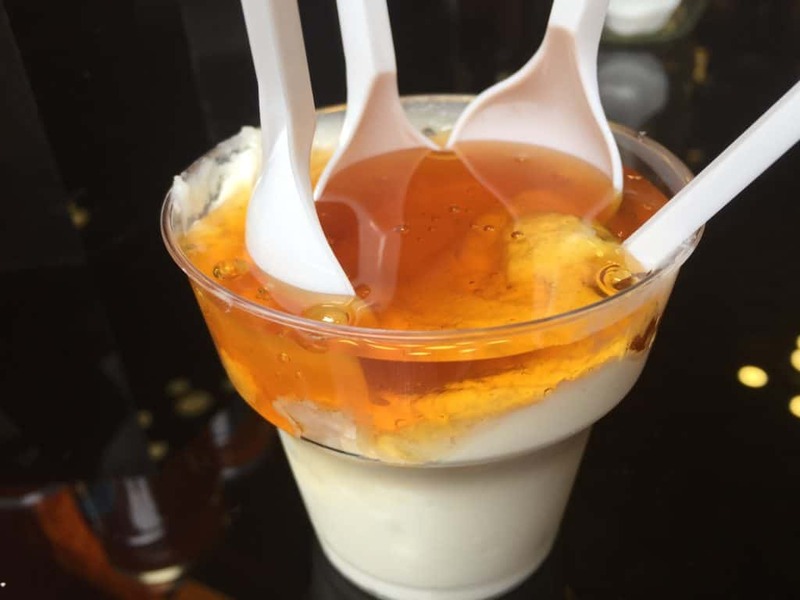 The proprietor dipped up tangy Turkish yogurt—which is Greek yogurt, but they insist that it was invented in Turkey and misbranded—with oodles and gobs of insanely flavorful local honey. It tasted so good that I raved about it for the next two days, and made @FareWhispers come back on our last day to find the store again. 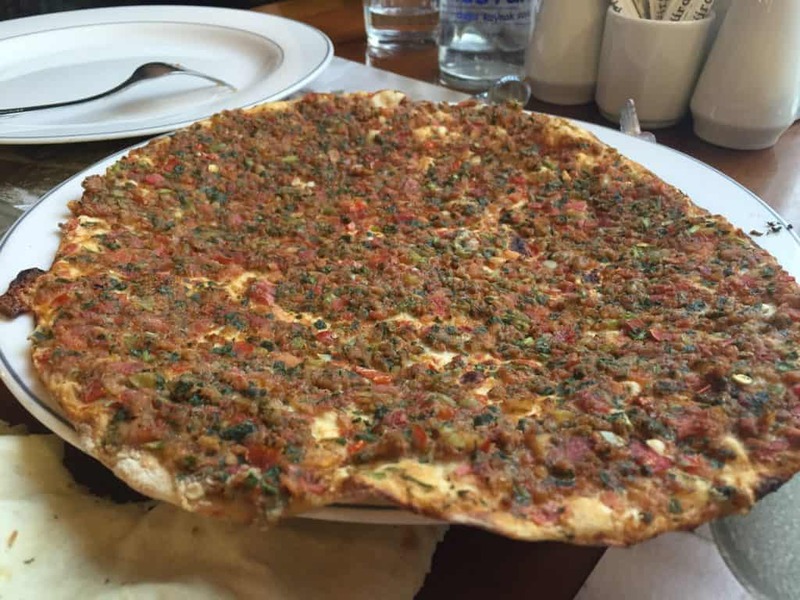 Next up we had lahmacun, Turkish pizza on a very thin flatbread. It’s yummy, though nothing super special. To give it additional flavor, you squeeze lemon juice on it and sprinkle flat parsley, then roll it up to eat. Finally, we completely stuffed ourselves with a traditional kebab plate. The meat was moist and tender, with yummy spices and maybe ground pistachios? 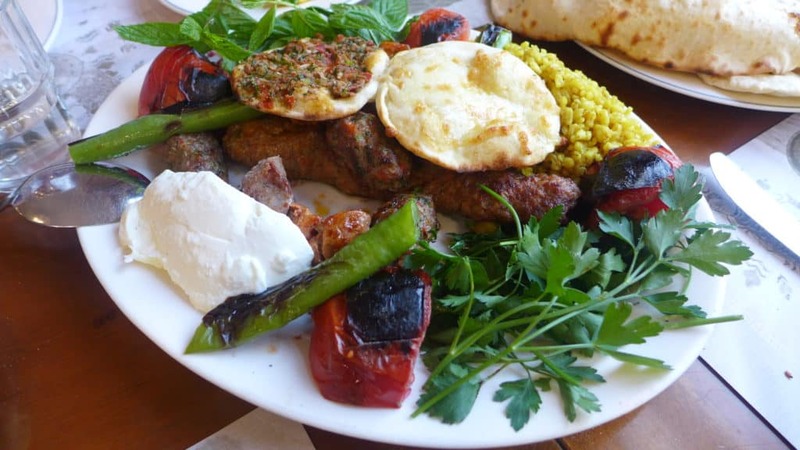 It came with grilled vegetables, some more tiny lahmacun, yogurt (which is omnipresent with every entree), and fresh herbs. 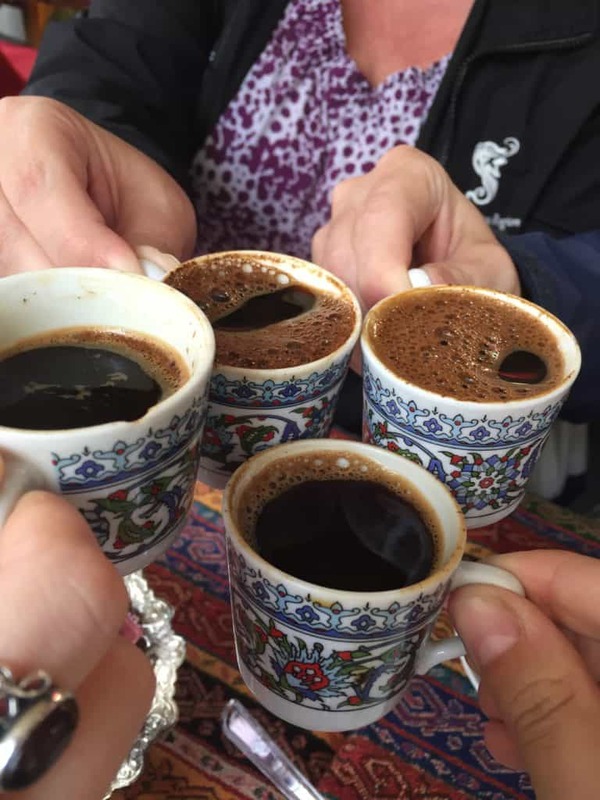 We could barely breathe at this point, but soldiered on to our last stop…a cafe for authentic Turkish coffee. While our good waiter friend gave us caffeine with a bit of theater (see the split-second video below), Kerem walked across the street and picked us up some mouth-watering soft baklava. I seriously could eat baklava all day every day. Isn’t that ceramic pattern gorgeous? I spent the rest of our trip trying to find a regular-size coffee cup just like it for my mom. 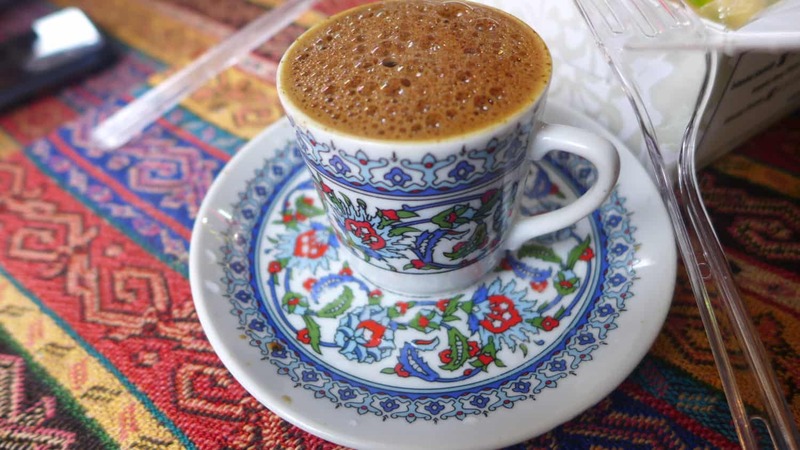 Turkish coffee is an interesting experience. It’s prepared using unfiltered coffee, finely ground beans are simmered (but not boiled) in the pot, with sugar if desired (make sure you ask for sugar when you order it). Then it’s poured into the cup where the grounds are allowed to settle. I was told to keep swishing mine around so that I didn’t get all grounds at the bottom, but…well, those cups are super tiny and it was all grounds at the bottom. It was good, but it’s not going to turn me off of espresso any time soon. *sigh* It was a perfect tour and a perfect day. I totally loved the Asian side of Istanbul, so much that we took the ferry back two days later on a beautiful sunny day and wandered around for a few more hours. 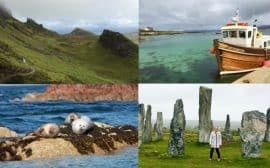 TripAdvisor is your friend no matter what, but I found a ton of great ideas on Pinterest. We took a 4-5 hour tour with Walks of Turkey over to the Asian side, which I initially found on someone else’s blog post (see below). We also took a tour the night before (which I’ll cover in another post) where we ate dinner at a local Kurdish family’s house and learned about their lives. 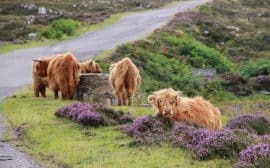 We took the 4-5 hour tour with Walks of Turkey, which I initially found through this post on Live Do Grow, and vetted through TripAdvisor. 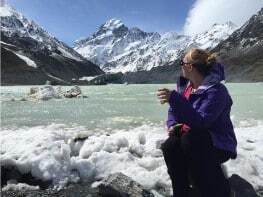 It cost around $70-75 per person based on the exchange rate at the time, and we were extremely happy with it. The tour happens rain or shine, so make sure to dress appropriately. Don’t forget to tip your guide if they do a great job! 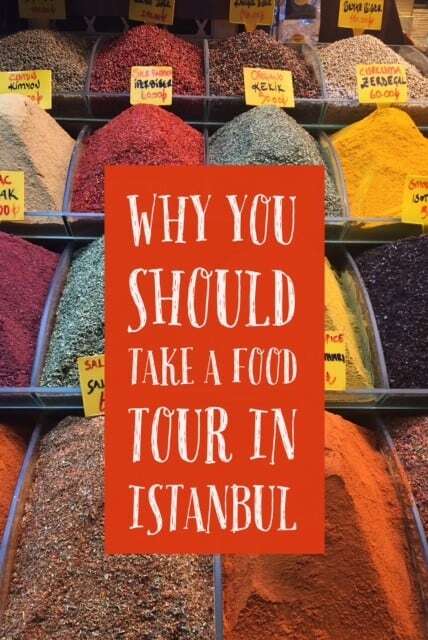 Have you ever taken a food tour? 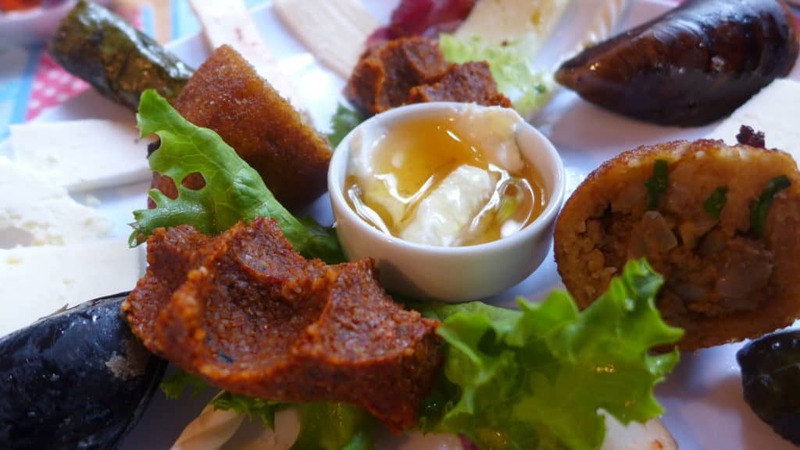 What’s your favorite food in Turkey? Ha, that makes sense! It’s funny how whoever “brands” it ends up getting credit way down the line. 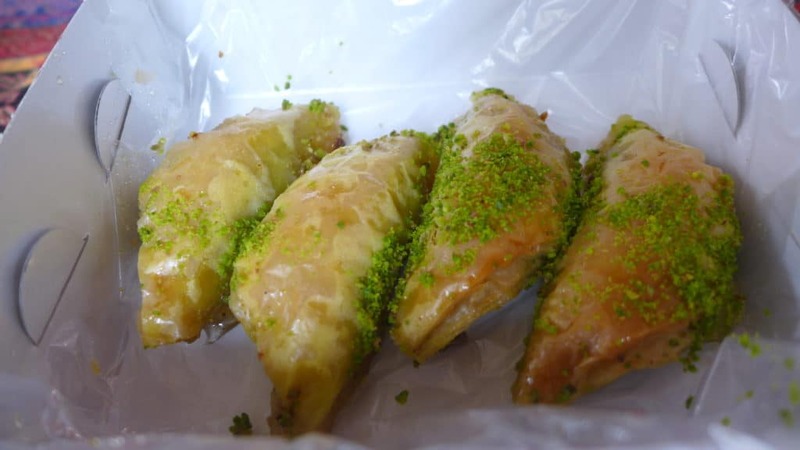 I loved Turkish food so much…and baklava is one of my faves!